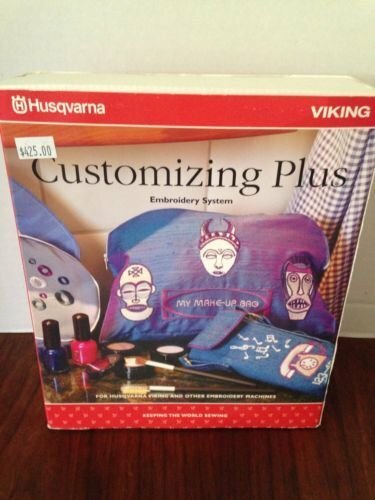 Explore the possibilities with embroidery designs and your computer with the Husqrvana and Viking customizing plus Program. Combine different motiffs with shapes and fonts. Make alterations and see your embroidery on ther computer screen exactly as you will see it. 1. Rotate designs by any degree. 5. designs on screen are displayed with the name, height, width, stitch count, colours and notes and can be printed so you have a permanent record and template for placement. 7. See thumbnail images of your designs for easy selection. 8. set your screen baskground and grid to any collour in the 16 million colour pallete. Turn the grid on and off or change the size. 9 Customizing plus matches nearesty colours automatically from your original designs. 10. see your designs on the screen with actual stitches in Quick 3Dstitch. 13. Customizer Plus comes with 17 major FONTS. 14. Fonts and shapes can be created in any size. The stitch count is Automatically adjusted so the result is always Flawless. 15. Lettering and Monogramming can be placed in many different shapes. 16. Automatic Kerning accuratley determines the best spacing between letters and positions them with precision. 17. Nearest point joining means that letters are connected at the closest point for for faster stitching. *** Orint thumbnail pictures of the designer for easy reference. You can View , Load, and save designs in most major Formats.